Living on a budget doesn’t mean you have to just sit inside your house and never have any fun. In fact, there are plenty of fun things you can do at home to have fun with your friends and family that cost very little. Just by thinking carefully about your entertainment options and picking the ones that get the most value for your money, you can have a great time at home all while staying on budget. Unlike years gone past, movies are now rather cheap to rent, often available for just $1.00 or so. Most grocery stores have movie rentals available for an affordable price, meaning you can pick them up when you are at the store doing your usual shopping. As opposed to shelling out $10+ just to go sit in a theater, you can have a movie and snacks at home and likely for less. If you’re a member of Amazon Prime , then it’s even better as you get movies for free through your membership! Not all fun has to involve technology. Board games are inexpensive, and can be used for years and years. If you look for sales, even some of the most popular games can be purchased for less than $20. Just as with board games, there are many games you can play in your backyard that cost next to nothing. What I like about this is that not only do you get to have fun at home, but you can get some exercise while at it. If you have children, they will likely enjoy doing small craft projects at home with you. These projects can be quite affordable if you shop wisely and look for sales. Also, find project ideas that reuse various items from around the house that would have otherwise been thrown away. As a parent myself, I’m always amazed at what our kids can do craft wise with very little. Point being, it doesn’t require much spending on your part. A deck of cards only costs a dollar or two, and there are countless card games that can be played by the whole family. Use the internet as a resource to find ideas for various card games as you should be able to find games that work for whatever age group of people you are going to play with. Cooking, rather than being a chore, can actually be a fun family activity. And since you are going to be buying food for your house anyway, it is an activity that really doesn’t cost any additional money. Include the kids in the cooking process by giving them small, safe jobs that contribute to the meal. Not only will they have fun working with you, but they will also gain skills that are helpful later in life as well as introducing them to ways to eat healthy while at it. In an age where everything is digital and high-tech, sometimes going back to the basics can be fun for the whole family. Sitting around the living room telling stories won’t cost anything, but it is a great way to build relationships and have a relaxing evening together. What are some other fun things to do at home that are cheap? How do you involve you kids in them, assuming you have them? What’s your favorite board game? Chess is the all time favorite entertainment we do at home. 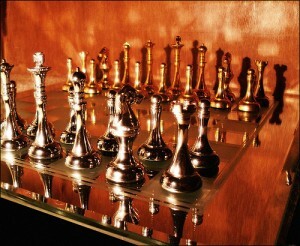 I just thank my wife who teach kids how to play chess that they like it so much. So we don’t have to go out just to have quality time because inside our home we can have fun that cost very little. Very cool Jason! Can’t beat having something like that to be able to enjoy together at home. I’m a big reader– that’s my cheap and fun form of entertainment. Also writing! When I’m with my little sister, who is eight, we spend a lot of time baking. She LOVES making chocolate goodies: brownies, cakes, frosted brownie cakes, you name it! And doing so tends to be much cheaper than, say, going to Chuck E Cheese. My favorite board game is probably Settlers of Catan, though I go back and forth with Monopoly (classic!). I’m a reader as well, though I don’t get to do as much of it as I’d like for pleasure. We have friends who’re big Settlers fans. We’ve never played, but it sounds interesting. You basically just summed up our evenings and weekends! My kids love to watch movies and we play a lot of board games and made-up games. Yep, that pretty much sums up our free time as well. Cheap and easy works for us. We use Netflix for movies and we sometimes will play some card games. Dh and I will also try out a new recipe every now and then. There’s a lot of fun things to do at home and especially during the winter, I’m not too interested in going outside. Sounds a lot like us Kassandra. There’s often stuff you can find to do, especially if you’re a little adventurous. I love playing games. One of my favorites is called celebrity. It’s like a combination of taboo and charades and always a good time. Great list!! My son has to shut down all electronics after dinner and one of the things we love to do the most are board games and cards. Right now, his favorite is Uno and we play that for about an hour almost every night of the week. It is actually a great time for us to find out about his day and ask him questions because he is having fun playing and usually opens up the most. So it’s frugal and family beneficial! I’m a homebody, so I love this list. I love making a big meal and sitting on the couch watching a movie. We like to do the same thing as well Michelle. But, with us being home so much these days we like to get out as well. We love to play Scrabble and do jigsaw puzzles. We only do them in the winter when we are trapped inside because of the cold. In the summer/spring/fall we usually go to the park with a blanket and a book. My wife and kids are big puzzle people. I don’t have the patience for them. But, we love spending time outdoors when the weather allows. Even better than renting a movie? Checking them out from the library! We’re lucky that out library has a decent selection and an online reservation system that makes it mostly painless to get what we want to watch. Not quite as easy as Redbox, but 100% cheaper. Totally agree on board games. We love Ticket to Ride and Settlers of Catan, but any game will hook us for a while! Great point Mr. FW! If you can get a movie at the library then it only makes sense to go that route. Our library doesn’t have the best options available but know plenty others do. What’s not to love about this list?! Don’t forget to have friends over to play any kind of board games. (Scattegories, apples to apples, pit) A good way to catch up, have fun and save money! That’s a great point Nick! We did that all the time before we had kids and still do to this day. We love watching movies with my family and also with popcorn in the side. Sometimes, we also play cards or cook a special menu with my daughter. My husband and I love to rent movies. The problem is, when we don’t return them on time and we have to pay ridiculous fines.